The oil extracted from lilies, Lily Absolute, has healing and softening properties. Especially, when the lily essential oil is mixed with that of calendula, it works wonderfully for sensitive skin. Some benefit has been shown for the use of Lily Essential Oil and Calendula in the treatment of cuperosis or spider veins. Lily oil (with Calendula) can be used for massage, in a bath, after a bath, for dry cuticles and elbows, as a facial moisturizer, under-eye oil and hot-oil treatment. Lilium auratum was first introduced to the Western world from Japan. 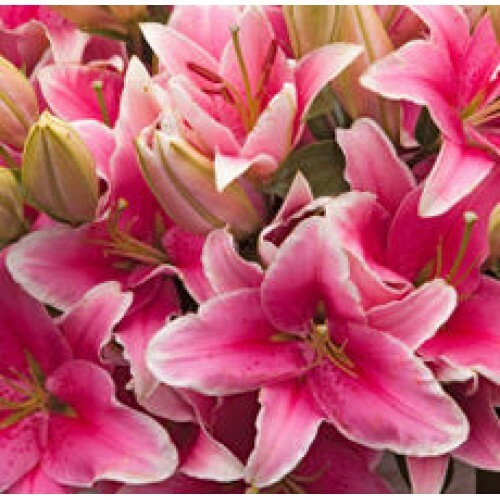 Lily essential oil is one of the most precious oils in the world and known for its heavenly aroma and fragrance. During the extraction process, fresh, fully opened flowers are plucked from the Lily plant and carefully laid on trays covered with a layer of palm oil. The essential oils from the flower petals slowly migrate to the palm oil and the process is repeated until the palm oil is completely saturated with the oil of the Lily. Then the Lily oil is separated from the palm oil by alcohol which then evaporated leaving only the pure Lily Essential Oil or Lily Absolute.